ALM’s The National Law Journal announced today the induction of Inspired Review into the Hall of Fame. 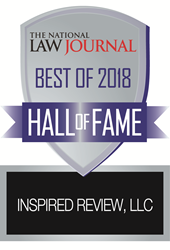 The Legal Industry has voted Inspired Review its Top Provider for the Last 4 Years which led the way for this tremendous honor. Inspired Review, established in 2013 emerged into the eDiscovery and Document Review World with the most disruptive and innovative technologies and processes. Inspired has become the fastest growing company in the Legal Industry and are on the cusp of even greater advances in 2018. Inspired Review has set the bar high for the eDiscovery world, becoming the Industry’s 1st Hall of Fame Member. Founded in 2013, Inspired Review is the most groundbreaking document review firm in the legal industry and the Pioneer of Remote Document Review. With advances in data security and skills testing and metrics technology, through its proprietary software, ReviewRight, Inspired Review has built the largest network of highly qualified document review attorneys in the United States. Inspired Review ensures the defensibility of your review and minimizes the risk of error through statistically validated quality control, developed in-depth validation and targeted search methodologies. Inspired Review is also very concerned with igniting change in the world by giving back. A percentage of all the company's profits are donated to a monthly sponsored charity.